Step outside, open this book and embrace the nature all around you throughout the day. A fantastic activity book to inspire half term holidays and outdoor activities as well as indoor fun for rainy days. In the morning, design your very own nature trail, seek and find caterpillars or cut out pages to make a beautiful snail shell. In the afternoon, why not make some decorative bunting for a garden party? And then find your way through the bumblebee maze or colour in a butterfly's wings. At night time, spot constellations dancing across the sky. 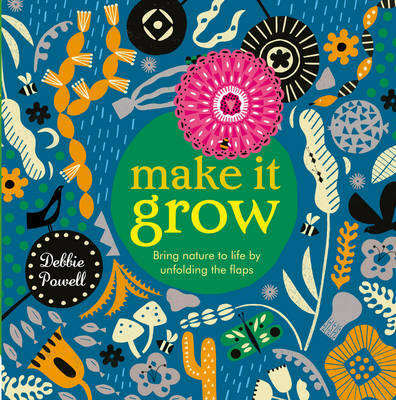 In this beautiful interactive book illustrated by the wonderful and talented Debbie Powell, you can explore nature throughout the day - uncovering birds, bugs, plants, animals and so much more. Published in partnership with the RSPB, the largest wildlife conservation charity in Europe with over 1.2 million members and partner of Bird Life International, this book provides fun for the whole family.